Sportswriter Frank Deford was criticized for "mansplaining" -- and getting one of his facts wrong -- when he discussed on NPR Wednesday why women's sports don't draw big audiences. Deford, a commentator for NPR who has contributed to Sports Illustrated for more than 50 years, suggested that the lack of a professional women's soccer league prevented the sport from capitalizing on the enormous amount of attention generated by this year's World Cup. "Once it was over, there was no carryover," Deford said. "There was no women's soccer league to go on and to pick up that attention." There was just one problem: Deford overlooked the existence of the National Women's Soccer League. His oversight was called out by Maddy Evans, a member of the NWSL's Boston Breakers. In an email to CNNMoney, Deford admitted his mistake, saying he was "just wrong about the soccer league" and that it's "certainly fair to criticize me (and NPR)" for failing to acknowledge the NWSL's existence. NPR has added a correction to the segment. But Deford defended the crux of his commentary, saying that women's sports don't draw much coverage. "Hey, I wasn't approving of that, merely stating a fact," Deford said in the email. "Now, if you can find a woman (or man) to contest my point that women don't get much coverage, fine, let's hear from her," he added. In the NPR segment, Deford speculated that one reason for the disparity in coverage may simply be "inertia." "We've covered things one way for so long," he said. 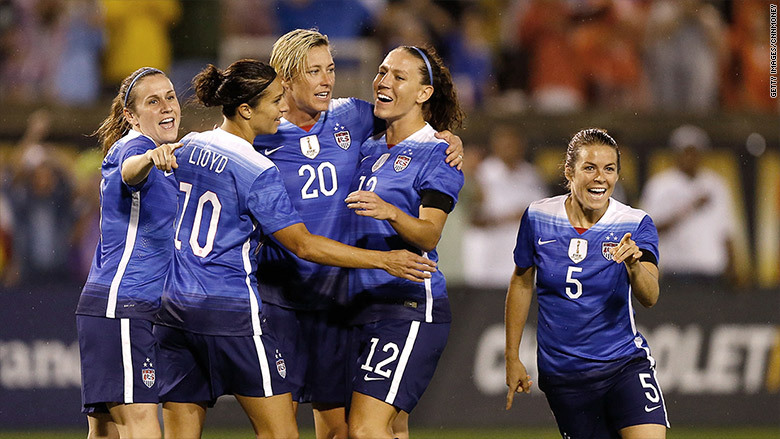 "Women are pretty new to big time sports, and perhaps the media hasn't caught up with them." Deford said that a league such as the WNBA could gain a larger following by becoming more involved in gambling and fantasy sports. He also offered a prescription that he acknowledged might be controversial. "People aren't going to like me for saying this," he said, "but I don't think that women have supported women's sports enough. I think that's the real thing. If you have women going out to see women's games, then that will drive the attention." The segment was panned by members of the media within hours of it airing on Wednesday. Joshua Benton, the director of the Nieman Journalism Lab at Harvard University, said it was not NPR's best work, calling it a "mansplaining/bad logic/ignorance triple!" Juana Summers, politics editor at Mashable, said NPR should have included "the voices of women" in the segment. A spokesperson for NPR told CNNMoney that the organization is "committed to airing voices from all sides of every issue." "That commitment continues," the spokesperson said. "That said, we should have done a better job of making sure the facts were straight. Obviously, we shouldn't have made the mistake about the women's soccer league. We corrected it."